Normally I am suspicious of adults who read children's books. No, that's not right. It's more that a lot of people I don't really like have tended to drone on and on at me in the past about how great the Lemony Snicket books are, and how much they're looking forward to the new Harry Potter, and how I had a deprived childhood because I never read any Diana Wynne Jones and the contempt I feel for these people sticks to the books and so I can't read them. Maybe it's a money thing. A lot of my issues are a money thing. 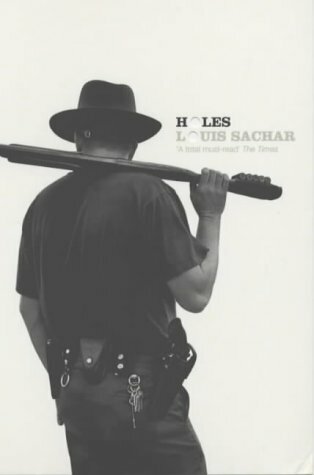 Anyway, Holes by Louis Sachar is not one of those books that privileged kids read. It's not about other worlds, although it has a strong magical realist spine, and it's not about fighting mysterious and powerful enemies heroically, although there are enemies to be fought. The writing is the kind I love nowadays. It gets the job done, moves the story along, gives you a clear picture of who's doing what and what's happening while leaving you to fill in some of the visual details yourself. The story concerns Stanley Yelnats, a boy who is in the wrong place at the wrong time and consequently gets sent to Camp Green Lake, which is nothing like a proper camp, has no lake, and is not green. He is told that he has to dig a hole every day, five foot wide by five foot deep and that this will build his character. And of course it does build his character. The book is all about pecking orders, fate, curses, symbolism, onions, love, making friends, solving mysteries, and it all only takes a couple of hours to read. I liked Stanley enormously. He's neither innocent nor overly cynical - not Oliver or the Dodger - but somewhere in between. This book is on the Junior Cert English curriculum, and I think that's a good thing. It's the kind of book that, if you like it, can open a whole world of similar but more complicated books to you. It's got a little bit of Marquez in it as well as some Steinbeck and could easily lead you away from children's books altogether without you even realising you're going. Great book. Sam and I read it on Eoin's recommendation, given that he ignored us for about a day while we were visiting so he could read the book. Well it was probably closer to one evening in Sally's living room, but you know what I mean. I don't have any problem with reading kid's books. Sturgeon's Law applies and there's as much crap there proportionately as with other lit. Kids' books are just cheaper to buy. Funny how everyone seems to have taken my remarks about people who read children's books so much to heart. As is always the way with these things, I suspect the people I was actually talking about will take no offence at all.